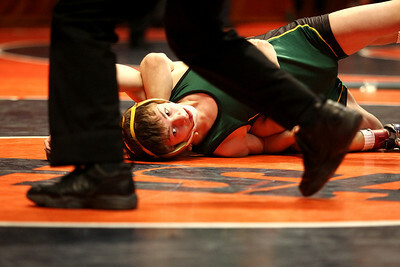 lbooth@shawmedia.com - Lance Booth Mundelin's Matt Ornoff grabs his hip in pain at the ISHA 1A Individual State Wrestling Tournament during the semi-final round at University of Illinois in Urbana-Champaign on Friday, February 17, 2012. 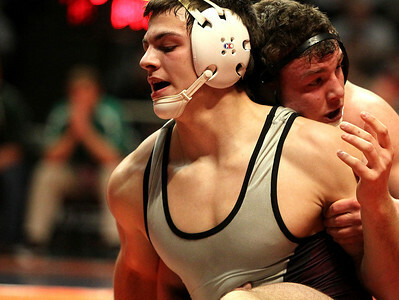 Ornoff lost the 138 weight class with a decision of 4-6 in overtime. lbooth@shawmedia.com - Lance Booth Coal City's Cody Minnick wrestles against North Boone's Brandon Briggs at the ISHA 1A Individual State Wrestling Tournament during the semi-final round at University of Illinois in Urbana-Champaign on Friday, February 17, 2012. Minnick lost in the 106 weight class with a major decision of 1-11.
lbooth@shawmedia.com - Lance Booth Marmion's George Fisher wrestles against Montini's Michael Sepke at the ISHA 2A Individual State Wrestling Tournament during the semi-final round at University of Illinois in Urbana-Champaign on Friday, February 17, 2012. Fisher won the 126 weight class with a major decision of 19-5.
lbooth@shawmedia.com - Lance Booth Wrestlers compete at the ISHA Individual State Wrestling Tournament during the first round consolations at University of Illinois in Urbana-Champaign on Friday, February 17, 2012.
lbooth@shawmedia.com - Lance Booth Marmion's Johnny Jimenez wins at the ISHA 2A Individual State Wrestling Tournament during the semi-final round at University of Illinois in Urbana-Champaign on Friday, February 17, 2012. Jimenez won the 113 weight class with a final decision of 5-0. Lance Booth-lbooth@shawmedia.com Crystal Lake South's Mike Romanelli wrestles against Ben Threloff of St. Rita at the ISHA 3A Individual State Wrestling Tournament during the first round consolations at University of Illinois in Urbana-Champaign on Friday, February 17, 2012. Romanelli won with a 6-4 decision in overtime. 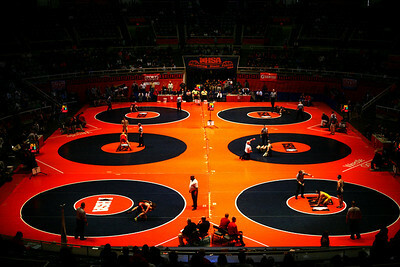 Lance Booth-lbooth@shawmedia.com Crystal Lake South's Mike Romanelli gets ready before a match at the ISHA 3A Individual State Wrestling Tournament during the first round consolations at University of Illinois in Urbana-Champaign on Friday, February 17, 2012.
lbooth@shawmedia.com - Lance Booth Coal City's Casey Brown wrestles against Dakota's Josh Alber at the ISHA 1A Individual State Wrestling Tournament during the semi-final round at University of Illinois in Urbana-Champaign on Friday, February 17, 2012. Brown lost the 120 weight class with a major decision of 4-14.
lbooth@shawmedia.com - Lance Booth Mundelin's Matt Ornoff wrestles against St. Rita's Tim Corse at the ISHA 1A Individual State Wrestling Tournament during the semi-final round at University of Illinois in Urbana-Champaign on Friday, February 17, 2012. 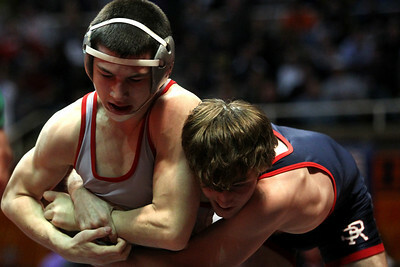 Ornoff lost the 138 weight class with a decision of 4-6 in overtime. 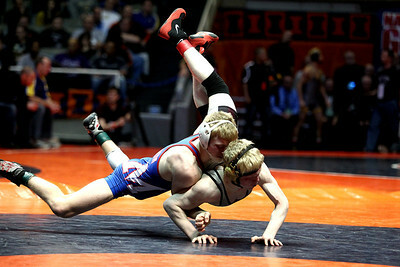 lbooth@shawmedia.com - Lance Booth Morris's Kenny Baldridge wrestles against Rock Island's Barlow McGhee at the ISHA 2A Individual State Wrestling Tournament during the semi-final round at University of Illinois in Urbana-Champaign on Friday, February 17, 2012. Baldridge lost the 113 weight class with a final decision of 7-9.
lbooth@shawmedia.com - Lance Booth Dekalb's Doug Johnson wrestles against Civic Memorial's David Pearce at the ISHA 2A Individual State Wrestling Tournament during the semi-final round at University of Illinois in Urbana-Champaign on Friday, February 17, 2012. Johnson lost in the 126 weight class with a 5-7 decision. lbooth@shawmedia.com - Lance Booth Marmion's Angelo Silvestro celebrates after a win at the ISHA xA Individual State Wrestling Tournament during the semi-final round at University of Illinois in Urbana-Champaign on Friday, February 17, 2012. Silvestro won the 138 weight class with a decision of 7-5 in overtime. 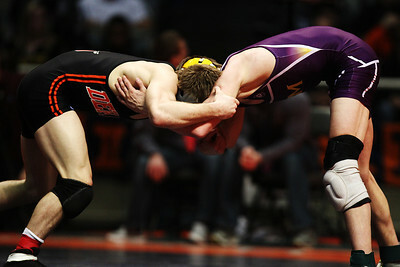 Dekalb's Doug Johnson wrestles against Civic Memorial's David Pearce at the ISHA 2A Individual State Wrestling Tournament during the semi-final round at University of Illinois in Urbana-Champaign on Friday, February 17, 2012. Johnson lost in the 126 weight class with a 5-7 decision.